Planning for a girlfriend getaway to New York City is a challenge since there is so much to see and do in the Big Apple. It won’t be possible to do the entire city in one trip, so you will need to make some hard decisions. If you’re heading to NYC for your very first visit, here is what we believe are the top places and things you should check out for an unforgettable trip to New York City. Before we left for our trip we decided to try out the NYC CityPass, it allowed us access to the big attractions we wanted to see. One member of our group was visiting the city for the very first time and so we wanted to check out the important NYC hot spots. The price of the pass was much cheaper than the cost of buying the tickets at each attraction, plus having the pass allowed us to skip through to the security lineup, saving us some precious time. If you are in New York for just a few days the New York CityPass is perfect, you can visit 6 top attractions in the city including Statue of Liberty, Top of the Rock, 911 Museum and the Empire State Building. This attraction is busy! Even with the CityPass tickets we ended waiting for about an hour in the security line-up to take the ferry across to Ellis Island. When you get to the Ferry Station, you’ll see long lineups snaking everywhere, be sure to ask which is the appropriate lineup for you. We saw people lined up for ages in the ticket holder line and then having to head back to purchase a ticket, a frustrating and time-consuming mistake for sure! 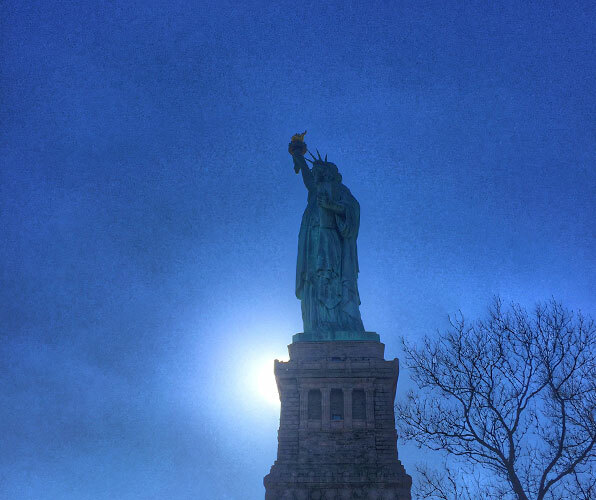 If you want to go up to the Crown of the Statue of Liberty, you will need to book the tour online at least three months before your visit. I love Art Deco Buildings and the Center has some of the most famous buildings of this architectural period, it was worthy of the many, many Instagram photos I took during our visit. The Top of the Rock Tour takes you up to the 70th floor to the Observation Deck, where you get a jaw dropping spectacular 360-degree view of the New York City skyline with Central Park, Empire State Building and Manhattan laid out in front of you. Once you’re back on the ground be sure to check out the beautiful sculptures located in and around Rockefeller Center, as well as the MOMA shop and the yummy La Maison Du Chocolat! Another iconic building in NYC and even more wonderful views of the NYC skyline, the Empire State Building is great to visit in the evening for that special nighttime shot of the city skyline, plus the security lineup is shorter at night. 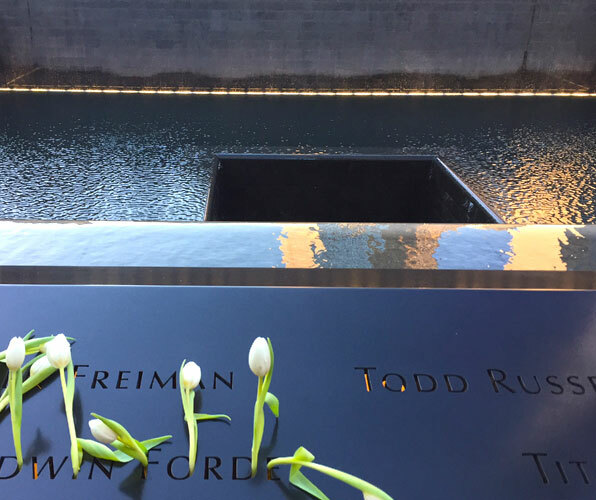 Beautiful, sad, inspiring… These are only words and words can’t begin to describe the emotions most people experience during their visit here. This lovely memorial is guaranteed to bring out feelings and emotions; it is a place of reflection and a place of remembrance. The Museum is definitely worth a visit, it does an excellent job of documenting the September 11 tragedy. 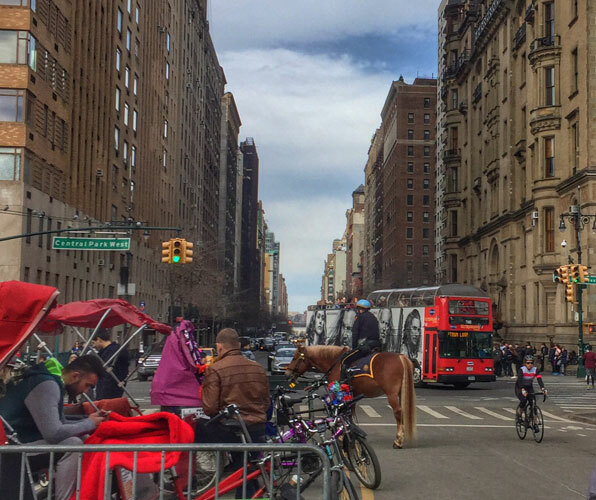 Biking in New York City, are you crazy? No! Do it, you will love it. We booked the two hour Central Park Bike Tour with Central Park Sightseeing, it was an easy meandering tour of the Park, with a great guide and nice, well-taken-care-of bikes. It was almost too easy a ride for me, next time I’m thinking of just renting a bike and heading over to the Hudson River Greenway, one of NYC’s most popular bike and pedestrian pathways. Broadway Shows are expensive and if you don’t want to spend hundreds of dollars to see the hottest new show we have a tip for you. Try out one of NYC’s Broadway Lotteries. The concept is simple, show up to the theatre about an hour before the show and submit your name in an old fashion lottery. The only drawback is the tickets are available as either singles or as a pair, but if you do win a lottery ticket, you will only be paying about $10 per ticket! We tried this during our visit and got two lottery tickets for the Book of Mormon, we ended up with front row seats, what a great experience! For some more information on how to score cheap Broadway tickets check out this New York Times article. New York City is a bustling, exciting town, and a perfect place for your next girlfriend getaway. Let us know your top NYC spots in the comments below.